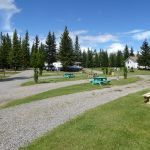 Ask fellow campers about "Dave's RV Park and Campground" and nearby attractions. I just spoke with the owner on Jan 2, 2017. He has retired and closed this RV park. We camped at Dave's RV Park and Campground in a Motorhome. Very clean and well kept showers, bathrooms and community room, we exchanged books. Didn't use wifi, Verizon signal was good. Very open spaces with garbage cans at site, convenient. Some sites had firepits. We camped at Dave's RV Park and Campground in a Motorhome. Just stayed one night and showers were hot and very, very clean. Costs are in Canadian funds. Arrived with the intent of staying 3 nights, but we were only showing as staying 1 night on their ledger. Paid in full for three nights and then explored the town of Vanderhoof looking for a restaurant, but none were found or open. Our site was not level and required pads to level. This park is situated on a modest slope. All services available on site and cell service was available. The park charges $3 plus tax for wifi and it is valid for only 24 hours. We would not stay here again. After seeing the lack of amenities in town, we told the owner that we may not stay 3 nights, but 2. We asked if he would credit us the night we gave up, his response: "Why should I?" The park was more than 50% vacant so he was not going to lose revenue. We camped at Dave's RV Park and Campground in a Travel Trailer. Anyone wishing to stay here needs to be mindful that they should pay on a day by day basis rather than prepay. This is the most expensive park we've stayed at this trip. It is really clean and well maintained and sites are a decent size so you are not crammed on top of your neighbor, however they advertise wifi but neglect to say you have to pay for it. At 3 dollars a day per computer you would expect good internet, but it is so slow you can barely send an email. If I come this way again I would stay at the municipal site. We camped at Dave's RV Park and Campground in a Travel Trailer. Nice RV park for an overnight stay. Sites are grass and the driveways are packed gravel. There's flower gardens and shade in some of the sites. Check-in is easy and the owner very friendly. There's an additional cost for Wi-Fi per computer, an additional cost for cable TV (that doesn't work) and costs based on pull-through, back-in or 30/50 amps. The park is very well kept-up and the owner's dedication to the park is obvious. I probably won't stay here again because of all the add-on costs, but the campground quality is a step above most of the ones I've stayed at since I left Alaska. We camped at Dave's RV Park and Campground in a Motorhome. Basic park with few amenities other than laundry. Utilities work fine, extra charge for 50Amp or cable. Not many people here. They say it does not get busy until July/August. Town is just down the street and has all the basics. Owner is very grumpy (wife says they want to sell). Best to just park, sleep, wake, and then quietly leave. We camped at Dave's RV Park and Campground in a Fifth Wheel. Although we did not stop, the town itself looked like it had quite a bit to offer in the way of restaurants and services. Are you affiliated with Dave's RV Park and Campground ?